IDF forces operating in the West Bank city of Hebron Friday killed two Palestinian terrorists, believed to be affiliated with Hamas' Izz al-Din al-Qassam Brigades. The two, Nasat al-Karmi and Mamun Natashe, are believed to have been part of the cell responsible for a deadly shooting attack, which took place on August 31 and left four Israelis dead. The IDF confirmed that a unit was operating in the city overnight – an operation which extended into morning hours, as gunfire erupted while the troops were surrounding several buildings in the Jebel Johar neighborhood. According to initial details, the operation began at 2am. Palestinian eyewitnesses said the troops surrounded three buildings and razed several more. 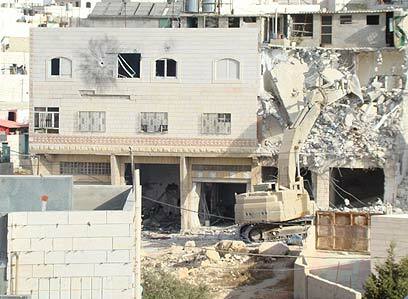 Another Palestinian eyewitness told Ynet that he saw two IDF bulldozers razing a three-storey building in the neighborhood, and that evidence of gunfire could be seen on the building's walls. Palestinian Authority official have yet to arrive on the scene. 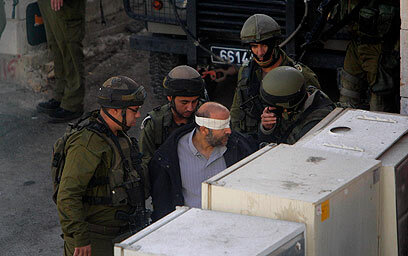 Friday's clash is somewhat irregular, as most nightly IDF arrest operations in the West Bank are uneventful. Defense Minister Ehud Barak lauded the IDF and the Shin Bet Chief for the successful operation, saying that the operation constituted "a fast response to the murder of four Israelis near Kiryat Arba. The IDF and Shin Bet will continue to relentlessly pursue terror organization wherever they are, to ensure the peace and security in Judea and Samaria." Meanwhile, Hamas threatened retaliation over "Israel's cowardice act": Hamas military wing spokesman Abu Obaida said that "This morning's crime is a slap in the face to anyone who still wagers on negotiating with the Occupation. The crime in Hebron was foreseeable, since the occupation's forces enter West Bank cities and villages freely, while the Palestinian Authority insist on curbing the resistance and waging a ruthless war on the Mujahedeen. "The resistance's men in the West Bank – despite the difficult conditions under which they have to operate and despite their persecution but Fatah security forces – will not ask for the Fatah or the occupation's permission to carry out more attacks." Obaida also congratulated the people of Hebron for "continuing to sacrifice shaheeds in the fight against Israel." The operation took place a mere few hundreds yards away from the Israeli Civil Administration compound in the city, which according to PA officials was evacuated prior to it. Palestinian security forces had previously arrested two of Natashe's brothers on suspicion of involvement in the string of shooting attack which took place in the West Bank in August. Palestinian Prime Minister Salam Fayyad denounced the operation, saying that "The road to peace does not go through killing our citizens, nor does it go through the settlements and settlers' terror. "Once again, the Israeli occupation chooses violence and death and we denounce this incident, regardless of its circumstances." Fayyad added that the international community cannot remain indifferent to Israel's refusal to allow the Palestinian Authority full security control of the Palestinian territories." Fayyad also warned against any incitement against the PA and its institution. Despite the censure, PA sources said that the Palestinian security establishment welcomed al-Karmi's elimination. Hamas' military infrastructure in Hebron has been a thorn in the Palestinian Authority's side, as it is a hub which they fear will spread throughout the West Bank. Al-Karmi, who was a senior Hamas operative in Tulkarem, was transferred to Hebron to accelerate the group's hold on the area. Hamas' political arm also issues a statement following the operation: Hamas spokesman Sami Abu Zuhri demanded the Palestinian Authority "release all the Mujahedeen imprisoned in its jails immediately, sever all security ties with Israel and unbridle the resistance, so it may fulfill its role in defending the Palestinian people." Friday noon saw Hamas release a special statement lamenting to two operatives. The statement said that the group held the PA and Fatah responsible "for this heinous crime, which wouldn’t have taken place if the heads of the (PA) organizations had not giving information to their Shin Bet handlers, and without the PA's relentless search for al-Karmi since the heroic attack of August 31." Fatah security forces have arrested over 1,400 Hamas operatives, detained 2,000 others and raided hundreds of homes in the 40 days since the shooting. Hamas also claimed that that the Shin Bet recently informed al-Karmi that he was to be deported, and will be arrested if he resists. "The blood of al-Karmi and Natashe will be the light that will guide our people. Resistance is the only strategic option to get rid of the occupation. "The fate of all traitors and collaborations will resemble that of Lahad's military (the SLA) and all the others who have betrayed their people." See all talkbacks "IDF kills 2 Hamas members in Hebron "